What classifies as a ‘greenwash’ when companies launch massive campaigns purporting environmental credentials? This is a complex issue which the Federal Trade Commission is currently busy researching ahead of issuing an update of its guidelines for environmental marketinglater in the year. It is of prime importance that clear rules or guidelines are invented. Not only because marketing and advertising are instrumental in determining what consumers can reasonably expect but also because marketing campaigns often signal what companies are all about at a deeper level. The FTC likely will consult its overseas counterpart in the UK and Europe. The controversy surrounding energy companies in Europe signals people’s patience with greenwashing is running out. Shell’s new ad campaign, launched recently, is a controversy in the making, say experts. In the past few years, several high profile greenwashing cases were brought against the company both by UK advertising regulators and by advertising watchdogs in the Netherlands and Belgium. “The FTC is likely to seek legal precedents by going after companies whose green claims have been under investigation”, according to an article on GreenAds, a blog about green advertising. The publication points out that Royal Dutch Shell’s latest ad campaign (designed by ad agency JWT, part of London-based WPP for Shell) is considered a profound case of greenwashing. The company is accused of wildly exaggerating its environmental policies. Greenpeace reacted to the ad by reiterating allegations that Shell is guilty of “greenwashing”. Shell is trying “to hide the fact that the company is actually going backward when it comes to renewable energy,” Greenpeace climate campaigner Jim Footner told the Wall Street Journal. It will be interesting to see how Shell’s new campaign will go down. The Wall Street Journal reckons that the oil giant is hoping to avoid controversy but that it isn’t clear if it has succeeded. The ad draws attention to Shell’s use of sophisticated technology to harvest oil. Nothing wrong with that, perhaps, except the company’s suggestion that it’s busy exploring renewable energy at a time that it’s actually reducing its investment in renewables because of profitability considerations. 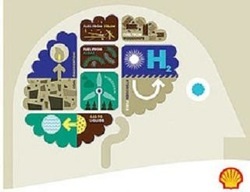 The ad, depicting a human brain full of alternative energy resources, is clearly misleading, according to environmentalists. They portend that renewable energy doesn’t play a considerable role on the Shell agenda at all, something the poster would have us believe. It’s the third time in recent years that these and other accusations have been made about Shell adverts. The company isn’t the only company under scrutiny of the regulators. ASA’s 2008 Environmental Claims Survey found that 6 percent of all ads in which environmental claims were made violated advertising codes in some way. Last Fall, the UK’s Advertising Standards Authority reprimanded Shell for ‘violating advertising rules’ due to its claims that projects in Canada and the U.S. involved ‘sustainable forms of energy’, something environmentalists pointed out was clearly misleading. The ad police wrist-slapped the company because it deemed there’s no evidence whatsoever that Shell was aiming to limit CO2 emissions. The advertising authorities in the Netherlands and Belgium came to the same conclusion. Shell retorted that the regulators didn’t understand the energy business and argued that its Canadian tar sand project is very sustainable because it doesn’t compromise the energy independence of future generations without limiting supplies for the current generation. Another ad, in which an oil refinery was outlined in flowers, formed another stumbling block. The ad, intended to communicate that Shell uses waste CO2 to grow flowers and create cement, was torpedoed by the advertising regulators because it created the impression that Shell treats all its CO2 in this way whereas in reality only a tiny portion is recycled. This type of repeated wrist-slapping shows that the company, awash with money, can afford to continue its course without too much trouble, even though management says they’re ‘kicking themselves’ with embarrassment. You might think that the make-believe world of advertising doesn’t really matter all that much, but these are clear indicators of policies pertaining to much more serious issues. Shell has already shown that it won’t hesitate to throw its weight around if it doesn’t like where politicians are leading by scaling back its investments in one of the UK’s most prominent renewable energy projects in the aftermath of the Brussels decision to impose mandatory limits on carbon emissions. The company’s management as much as admits that it doesn’t want CO2 to be reduced compared to today’s levels in a study entitled “Scenarios Scramble and Blueprints” (download the full 52-page pdf report). This research lists recommendations to policymakers which Shell has dubbed the ‘preferable blueprints scenario’. This foresees allowed CO2 levels of around 25 gigatonnes per year by 2050, a level virtually unchanged with today. Needless to say it’s much higher than IPCC recommendations and most government commitments, which suggest a reduction of between 60 and 80% before 2050. If you doubted it would come to blows, think again. The persistence of the company’s advertisements heralds a grim attitude. “[The] scenarios in Shell’s new report are in reality scenarios of doom and gloom” comments Willy De Backer, who follows EU and global energy policymaking on his blog 3eintelligence. The past U.S. administration’s energy policies, which had an uncomfortably tight correlation with the wishes of oil company directors and the coal industry’s agenda, show the dramatic influence that energy companies can play in making or breaking the environment.